Durkovic was part of a seven-student trip to Georgia in the International/Indigenous Course Modules (ICM) program, an opportunity for undergraduate students to travel outside Toronto, often internationally, for a unique hands-on learning experience abroad. Since the ICMs were first introduced, more than 50 groups of students have travelled to destinations in Asia, Africa, Latin America, the Caribbean, Europe and the United States. The goal of the trip was for Robert Austin, an associate professor in the Munk School of Global Affairs & Public Policy’s Centre for European, Russian and Eurasian Studies and the department of history, to introduce his students to the people and institutions who are making a difference in Georgia’s journey into its uncertain future. A post-Soviet state with two breakaway regions inside its territory, Georgia is split, in some ways generationally, between aspirations to democratize according to Western ideals and join Europe, and a longing for an imagined past of stability and a simpler life. Factor in the region’s role in the transport of natural gas and oil and the constantly varying stability of Georgia’s neighbour states – Ukraine, for one, is embroiled in ongoing crises – and you start to understand Georgia’s strategic importance to the European Union and NATO. Massimo Chiarella, a third-year Victoria College student in the Munk School’s Trudeau Centre for Peace, Conflict & Justice, met with filmmaker, screenwriter, producer and former head of the Georgian National Film Centre Nana Janelidze. Among her works is the screenplay for 1987’s Repentance, winner of the Grand Prix at Cannes. “When she began talking about her work, I realized I was speaking to a revolutionary who fought against the Soviet Union by depicting the rebirth of a post-Soviet Georgia on screen,” says Chiarella. To get around Soviet censorship, Georgian filmmakers would place nuanced anti-Soviet messages in their films that only Georgian audiences would recognize. Gloria Dragic, a fourth-year University College student majoring in political science with minors in European Union studies and history, interviewed Ana Khizanishvili, a United Nations human rights lawyer. Khizanishvili helped Dragic frame her research project about LGBTQ rights within a global context. “She got me thinking about my research as part of a much greater picture,” says Dragic. And Mathuja Jeyakumar, a third-year University College student double majoring in international relations and political science, met with Baia Abuladze, an entrepreneur who “transformed her generations-old family winery into a successful business that brought wealth to her region through tourism and investment,” says Jeyakumar. The students’ face-to-face encounters with key actors in Georgia’s cultural and political climate gave them a unique understanding of issues that may have otherwise seemed abstract in the classroom. Moreover, a few students, like Durkovic, were profoundly impacted with firmer ideas about the careers they want to pursue. 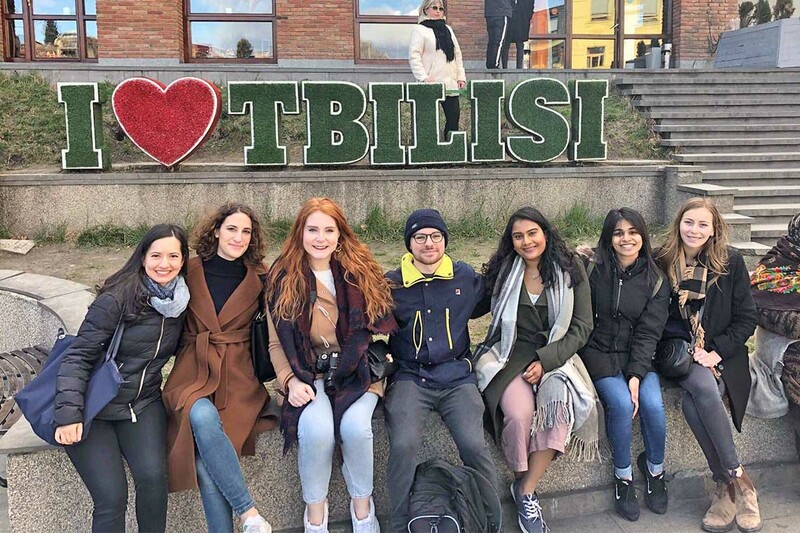 “After a meeting with the Caucasus Research Resource Center, I realized that research and policy analysis were exactly the work I wanted to do,” says Anahid Najafizadeh, a third-year Trinity College student specializing in political science and minoring in European Union studies. Outside of their research activities, the students were impressed by the friendly and helpful nature of the Georgian people, their history and their architecture. “Georgians consider every dinner an event so you know you’re going to leave full and happy,” says Tami Piovesan, a fourth-year St. Michael's College student majoring in European studies and political science who was the trip’s designated photographer. “As cliché as this might sound, everyone is right when they say the friends you make during your ICM will be friends for life,” says Piovesan. When asked if they would recommend the ICMs experience to other undergraduate students, the Georgia travellers were unequivocally in favour. “I think it’s easy to lose sight in a classroom of the very tangible constraints facing countries in transition such as Georgia,” says fourth-year Trinity College student Sanjana Shah, whose double major is in history and philosophy with a minor in political science.